Entebbe airport, according to allegations, has been a point of transit for different drugs. A number of policemen who work or have worked at Entebbe airport have movie-like stories to tell about how policemen, especially their bosses, have for decades ran a smuggling cartel that deals in drugs and other contraband. Last week, Sunday Monitor spoke to Mr Richard Okullu, a Corporal in the Police Force, who ran into trouble after exposing dirty deals involving ivory smuggling, drug dealing and other issues by officers of the Aviation police and other staff. Emboldened by Mr Okullo’s expose, a number of police officers who have worked in the airport security in varying periods stepped forward to corroborate some of the information Mr Okullo provided, and offered new details about the rot at the country’s only international airport. The revelations about what several police officers followed a swoop by the police’s Flying Squad Unit that resulted in the arrest of at least eight police officers including the Commandant of Very Important Persons Protections Unit, Senior Commissioner of Police Lodovic Awita. We asked police spokesperson Asan Kasingye why the policemen have continued to be held in custody for over a week, way beyond the 48 hours that the law allows for one to be held before being charged in a court of law. “This is an investigation which is open. If anyone has information they should approach the investigators,” Mr Kasingye said. He said the arrested officers will, according to how the investigations go, be charged in court or released on bail. We also put it to Mr Kasingye that a number of other police officers have been named by mostly their subordinates, past or present, as being involved in or abetting drug trafficking and other forms of smuggling. We talked to most of the policemen for this story on condition that they will not be named because they are not authorised to speak to the press. We were also unable to speak to a number of top policemen whose subordinates accused of participating in crime, so we decided not to name them. Our information points to the existence of an organised group that involves senior police officers and commanders, many of whom have since been relieved of command and authority at the airport, but continue to wield authority and control over their former subordinates in their new positions. The largest enterprise involves smuggling of narcotic drugs in and out of the country, trafficking humans, sale of ivory, prized rhino horns, aiding and abetting tax evasion and extortion from airport users. Multiple sources we spoke to also linked officials of the immigration, clearing and cargo handling. So lucrative is the enterprise that at one point, a source said, a senior police commander (names withheld), working with one of his juniors, operated a money lending business from the proceeds of money in US dollar bills and British pounds, that was impounded at the airport. Reports about the top cop engaging in the dirty deals were never acted on by his superiors. The business expanded from police officers to cover Civil Aviation Authority (CAA) and other airport staff to the rest of the community in Entebbe. One of our sources working in Entebbe confirmed to us that he had got a loan from a police officer at around that time at 20 per cent interest. We spoke to other airport staff who confirmed the same but could not go on record. So powerful was this junior police officer that he has worked in aviation police for more than 20 years without being transferred. Sunday Monitor also tracked down one of his former clients who did not want to hear anything about her former friend. After running out of money the officer borrowed from her and she has since been waiting for her money to be repaid. He has since told her she should consider it a bad debt. The police commander who owned the money lending business was later unceremoniously removed from command after he and his crew reportedly aided a fugitive from Rwandan to escape to the United States through Entebbe airport. 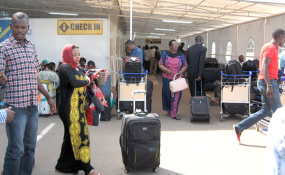 Our sources say the authorities in Ugandan had an interest in the Rwandan woman in question, but by the time they went for her at Entebbe, she was already flown out. The officer’s role in the escape was reportedly made known to his bosses, including police boss Gen Kale Kayihura, and that was how the commander was immediately removed from his job without even handing over to his successor. So powerful was the commander in question that the police constable who impounded the money, some of which was later to be used in the money lending business referred to earlier, was later falsely accused and charged, leading to his summary dismissal from the police force. His counterpart on that particular night watch in the airport parking lot did not want to have anything to do with the matter when we contacted her. She has since been transferred and now works at one of the airfields in the country. Our attempts to speak to the man in charge of the stores at the time also proved futile. “There were a lot of things happening at that time. I cannot remember, I cannot deceive you,” he said. The same officer has since been promoted and transferred to an upcountry airfield. In a closely related incident, a police constable impounded laptops that were being smuggled out of the country. The laptops were handed over to the commander we referred to and that was the last they were heard of. The laptops were impounded from the Enhas Cargo gate. The constable was rewarded with a rank of corporal and recruited into the “inner circle”. The dirty cops are so determined, our sources say, that they have even found a way of beating the airport baggage x-ray so that their contraband is not detected. Also, specific police officers are strategically deployed to ensure that dirty deals slip through seamlessly. The man charged with making sure that drug traffickers are not checked is a junior officer who has since been arrested. He ensured that “his people are not checked”. “If they have an interest in a bag, it doesn’t pass through the normal checking system. A police or security officer using the regular airport is supposed to be checked like any other user of the airport,” a police officer who did not want to be named for fear of retribution told this newspaper. But for this officer to succeed, the crew ensured that they had a man at airport x-ray. Ideally, manning the x-ray is the responsibility of the Aviation Security (AVISEC) under CAA, but the crew ensured that they were in charge of this too by deploying an officer who to date remains at AVIPOL according to our source. He would make sure his colleague and his goods or people pass undetected by the x-ray machine. The officer at the x-ray has been at it for at least eight years. In 2007, Senior Superintendent of Police (SSP) Colleb Mwesigye joined the police force. In his 10-year career as a police officer, Mwesigye, according to a statement issued by the police, was only deployed at Entebbe International Airport AVIPOL. In 2008, he was OC Station, AVIPOL and was the same year appointed Deputy Commandant of AVIPOL. Two years later, in 2010, he was appointed Commandant, a post he held until his death on Tuesday, aged 37. He was on the wanted list by the Police Flying Squad for alleged involvement in the 85kgs cocaine scandal involving Aviation Police. When his superior was fired, Sunday Monitor understands the officer took over the operation and even recruited more people to the team. A police officer was designated purposely to aid the removal of ivory and drugs in the police stores. The officer who was put in charge of the AVIPOL stores at Entebbe was only removed recently after government chemists tested cocaine in police custody only to find it was flour. Another policeman was added to the team. His job was to alternate with his colleague at the X-ray. When one was away, the other would take over. Last week, Sunday Monitor detailed how the late Mwesigye ran an ivory and narcotics empire of sorts at the airport until his group ran out of luck. Another critical recruitment was of an officer in charge of the welfare and other issues of the AVIPOL staff. He was deployed purposely to monitor stores and ensure strategic deployment especially when there was a consignment coming in or going out. The group would also ensure that suspects detained by the Aviation police never have a day in court but pay their way out to freedom. At least 85 suspects were never produced in court by AVIPOL although their files were sanctioned by police. It is the reason, Sunday Monitor has been made to understand why Zarugaba Tinka, a senior police officer in the Anti-Nacrotics Department was arrested. The police and other officials at Entebbe use all sorts of excuses to extort money from airport users. This is not just limited to the AVIPOL but includes immigration officials and other airport staff. In a space of less than two weeks, two AVIPOL constables have been arrested and detained for extorting money from travellers. Miriam Alwao, a Woman Police Constable was arrested on November 2 for allegedly stealing about $400 from a Canadian citizen at the police check point at Entebbe. Ms Alwao was checked and the money was found in her possession. She has since been detained and charged with theft. Another Police Constable also attached to the aviation police was arrested this week and detained on allegations of extorting $100 from a passenger whom he charged with smoking at the Police Check Point. The passenger reportedly paid the money as he didn’t want to be late for his flight. He, however, instructed his driver to follow up on the matter and when Zach Mitumba was searched, he was found in possession of the money. Although many police officers have been said to be committing and aiding crime, there are those who, aware of the situation, raised the alarm and pointed out the wrongs going on. One of those was Herbert Rheno Karugaba, Senior Assistant Commissioner of Police (Retired) who in a letter to Gen Kayihura as the police force celebrated 100 years in 2014 said, “In the gazetted ranks you hurriedly promote officers because they are “malleable” when it comes to obeying unlawful orders. Sometime back a large haul of narcotic drugs worth millions of dollars was intercepted by Entebbe Airport security. It was handed over to the then Officer in Charge of Entebbe Police Airport Police Station, Herman Owomugisha, and was properly exhibited. Shortly afterwards, this exhibit went missing. Instead of you ordering for a proper investigation of the matter, you transferred Herman Owomugisha away with great alacrity, and hurriedly promoted him. He is currently a full Commissioner of Police, barely 13 years after he joined the UPF, and having never attended a Senior Staff Command Course.